The Nebraska Cornhuskers travel to Bryce Jordan Center to play the Penn State Nittany Lions on Thursday, February 25, 2016. The opening line for this game has Nebraska as 1 point favorites and the over/under has been set at 140. The Cornhuskers come into this game with an overall record of 14-14 and a road record of 3-6. They are 13-10 against the spread and their over/under record is 14-8. The Nittany Lions have an overall record of 14-13 and a home record of 9-3. They have an over/under record of 12-14 and they are 13-12 against the spread. Andrew White III comes into this contest averaging 17.4 points per game while playing 29.7 minutes per night so far this season for the Cornhuskers. He pulls down 6.1 rebounds per game and dishes out 0.6 assists per game as well. His field goal percentage is 50% while his free throw percentage is currently at 79%. Shavon Shields averages 15.7 points per game in 30.4 minutes per contest this season. He averages 2.9 assists per contest and 5 rebounds per game for Nebraska. His field goal percentage is 47% for the year while his free throw percentage is 74%. 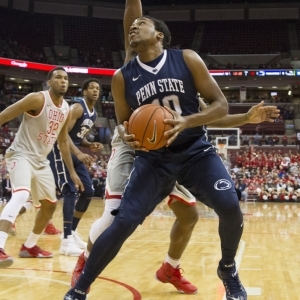 Brandon Taylor averages 16.6 points per game while playing 31.9 minutes per contest this year for the Nittany Lions. He grabs 6.5 rebounds per game and has 1.6 assists per contest on the year. His field goal percentage is 44% and his free throw percentage currently is at 72%. Shep Garner averages 13.7 points per game this season and he sees the court an average of 34.7 minutes per contest. He also averages 3.1 rebounds per contest and 3.1 assists per game. His field goal percentage is 37% and his free throw percentage is 78%. Nebraska averages 72.9 points per contest this season which ranks them 167th in the nation. Their average scoring margin is 4.4 and their shooting percentage is 45% as a team which has them ranked 108th. Behind the arc they shoot 35% which is good for 157th in the country. They average 35.8 rebounds per game and 12.1 assists per game which ranks them 174th and 247th in those offensive categories. In the turnover department they rank 105th with 11.9 per game. The Cornhuskers allow 68.4 points per game to their opponents which ranks them 81st in the nation. They also allow a 43% shooting percentage and a 36% average from behind the arc ranking them 151st and 241st in those defensive categories. Opponents average 33 rebounds a game which ranks 56th and they give up 12 assists per contest which puts them in 86th place in the country. They force 13.1 turnovers per game which ranks them 135th in the Division 1. Penn State averages 65.6 points per game this year which ranks them 308th in Division 1 college basketball. Their average scoring margin is -3.1 and their shooting percentage is 41% as a team which has them sitting in the 301st spot in the country. Behind the arc they shoot 30% which is good for 334th in the nation. They average 35.1 rebounds per game and 9.8 assists per contest which ranks them 214th and 344th respectively. In the turnover department the Nittany Lions rank 52nd with 11.3 per game. The Nittany Lions allow 68.7 points per game to their opponents which ranks them 90th in the country. They also allow a 42% shooting percentage and a 36% average from behind the arc ranking them 97th and 266th in those defensive statistics. Opponents average 35.6 rebounds a game which ranks 161st and they give up 12 assists per contest which puts them in 84th place in the nation. The Nittany Lions force 11.7 turnovers per game which ranks them 258th in college basketball. The Cornhuskers average 70.7 points per game on the road this season and they have scored 65.3 ppg in their past 3 contests. They have an average scoring differential of -3.6 on the road and in their past 3 games their difference is -1 per contest. The Cornhuskers have an offensive rating of 107.5 and they assist on 46.2% of their shots. In terms of pace they average 67.1 possessions per 40 minutes and their effective field goal percentage is 51%. As a team they have a true shooting percentage of 54% and they shoot 3 pointers on 33% of their shots. Nebraska turns the ball over an average of 15.2 times per 100 possessions and they get a steal on 10.8% of their opponents possessions. Their total rebound percentage is 52.1% while their offensive rebound percentage is 32.5%. The Cornhuskers give up 74.4 points per game on the road this season and they have surrendered 66.3 points per contest in their last 3 games. The Nittany Lions score 70 ppg at home and they have averaged 67.7 points per contest in their last 3 games.They have an average scoring differential of 0 in their past 3 contests and at home this season they have a difference of 2 points per game. The Nittany Lions have a rating on offense of 98.9 and 42.6% of their shots are assisted. They possess the ball 66.4 times per 40 minutes and their effective field goal percentage for the year is 46%. As an offensive unit they have a true shooting percentage of 50% and they attempt 3 pointers on 36% of their shots. Penn State turns it over an average of 14.9 times per 100 possessions and they steal the ball on 7.8% of their opponents possessions. Their total rebound percentage is 49.6% while their offensive rebound percentage for the season is 29.6%. The Nittany Lions give up 68 points per contest at home this year and they have given up 67.7 points per game in their past 3 contests.